When you were a kid, getting action figures was always nice - you appreciated your new toys, and had fun with them. But ultimately, they were sort of an ordinary acquisition: no, for a really special occasion, you have to go up a level, to the times you got a new playset or vehicle. Large sets like that were all over the place back in the day, but GI Joe was the undisputed king. These days, no stores want to carry something that large, so a company even releasing a vehicle is rare. It's a shame, since some of the few releases in the past few years have been among the best ever made. 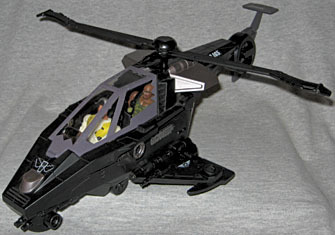 For example, the Rapid Heli-Integrated Neutralizing Offensive Vehicle, or R.H.I.N.O. At a glance, the R.H.I.N.O. obviously owes a lot to the APC in James Cameron's Aliens. Though it isn't a direct copy - not even close - the designs are very similar. A wide, flat armored personnel carrier with a slightly angled profile and some huge tires? It's like different model years from the same manufacturer or something. The R.H.I.N.O. is almost entirely assembled when you take it out of the box, which means thick, sturdy construction. It's about 14" long, 5½" tall and 7½" wide, and is definitely a low-rider: there's only ¼" of clearance under the middle of the vehicle, which means this fearsome war machine could be hampered by a particularly nasty curb. With an overall design that is sloped and angular, the R.H.I.N.O. is very stylish. The driver sits under an armored canopy that's centered on the body, and there are two flip-open canopies on the from corners that can seat single figures. Large armored doors are found on both sides of the R.H.I.N.O., opening on troop transport areas. 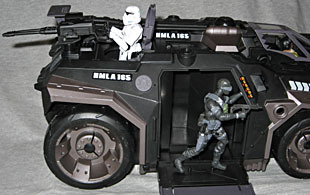 There's a gunner's port on the right rear corner, with an armored hatch on top; a panel on the left rear corner opens, but that's mostly so you can access the figures, not anything designed for the characters to use. All four wheels turn freely, and the rear wheels are slightly larger than the ones in the front. The R.H.I.N.O. has five different weapons, which can be plugged into any of the standard-sized ports all over the vehicle. There are two different machine guns, two matching three-rocket launchers, and one single-rocket launcher. There are four ports on the roof, one on the front corner, and two by the side doors, so you can put the guns wherever you want. The right side door is spring-loaded; press a small button and it opens and slides out, allowing a figure standing there on the footpegs to pop out and lay down some cover fire. There's one more surprise waiting for anyone who tries to ambush the R.H.I.N.O. 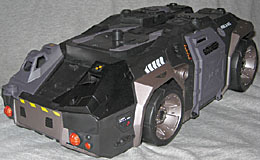 as it rolls across the battlefield: press a button on the back end, and a platform in the center of the vehicle slowly raises, revealing a small removable helicopter. The helipad rises at a controlled rate - it takes about four seconds to lift 2" - but that adds a touch of realism. A real helicopter couldn't just hop up from a resting position, after all. As it comes up, small stabilizing wings fold down from the sides; pull up the rotor and spread the blades, and your whirlybird is ready to fly. The R.H.I.N.O.-copter lifts off the elevator easily, and the propellor spins freely. The rear stabilizer looks like it should spin, but since it's a molded part of the tail, it doesn't actually turn. There's a chin gun under the copter, and a total of six (!) more weapon ports on the flier. Since the helipad lifts up, the ground unit doesn't look like a chunk's been taken out of it when the R.H.I.N.O. splits in two. The helicopter also shares the same design elements as the roller, so the two really look like two halves of a single unit. This is a very good design. With two seats in the cockpit, two on the front corners, and three passenger areas, the R.H.I.N.O. 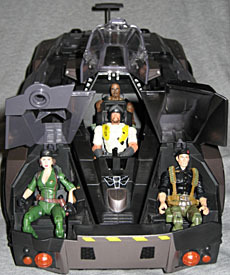 can hold 12 figures easily (if a bit crowded), and one of those figures is going to be the included driver, Cannonball. Rumor has it that Cannonball got his nickname because he once did a stint as a human cannonball. The wild-and-crazy driver/helicopter pilot for the powerful R.H.I.N.O. won't confirm or deny the rumor. He used to test-drive trucks before enlisting in the military, littering roads with the remains of vehicles that he'd rammed, crashed, and blew the cylinders out of, to test their stamina and stability. The machines were towed away in pieces, but CAnnonball always walked away without a scratch, ready for more. He knows exactly how much the R.H.I.N.O. can take and drives it to within a lug nut of its life. He pilots the helicopter with the same fearless enthusiasm he demonstrates on the ground, making for a white-knuckle ride on land or in the air. Cannonball is a new characer, but he's made up entirely of old parts. His legs and torso come from Barrel Roll, his arms are from Switch Gears, and his head is from Roadblock Heavy Duty. The colors are fairly muted, so he isn't an eyesore, even if that yellow is a strange choice. His only accessory is a black helmet with silver goggles pushed up onto the forehead. The R.H.I.N.O. 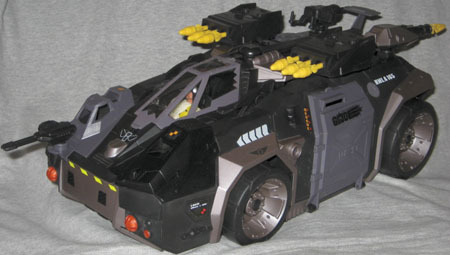 is a really fun vehicle, and ranks right up there with some classic favorites like the H.I.S.S. Tank or the Snow Cat when it comes to good design. The R.H.I.N.O. was released in 2005 as part of Hasbro's online-only "Direct to Consumer" scheme, which means a lot of fans don't even know this vehicle exists - a real shame, considering how awesome it is. I found this one for $10 at a bargain discount retail store, and it was absolutely worth every penny. It originally retailed for $30, and even that is a fair price. The R.H.I.N.O. is detailed both inside and out, and really fun to play with. Buy one, and load it up with all your favorite Joes.